This exploratory study examines nutrition literacy in two parts: 1) the level of attention to health literacy among nutrition professionals, and 2) the nutrition professional’s perspective of skills/ knowledge needed to understand nutrition education. Part 1 included an online survey in which RD participants (n = 206), recruited from three dietetic practice groups, identified use of health literacy assessments during client education. 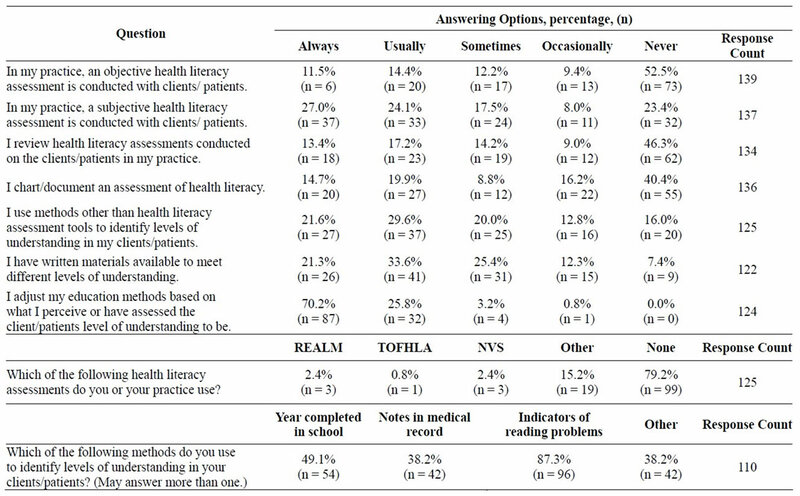 Most participants (79%) did not use a validated health literacy assessment. There was a significant difference in response to having written materials for different health literacy levels depending on time spent providing nutrition education, with those sending less time in education responding they more often had more materials (Chi-square 8.6, p = 0.035) and depending on job description, public health more often than outpatient dietitian (p = 0.006). Part 2 utilized key informant interviews (n = 8), administered by telephone. Content analysis revealed a significant theme among answers that the skills required for understanding diet education is dependent on the type of diet instruction provided, with diabetes frequently noted as a disease requiring greater knowledge and skills. Nutrition educators need an instrument to assess client nutrition literacy. Potential instruments should assess skills related to portion size estimation, macronutrient knowledge, interpretation of food labels, and food grouping. Education is vitally important for successful health outcomes, but information that is not understood by the client is futile and potentially harmful. Health literacy has been defined as “the degree to which individuals have the capacity to obtain, process, and understand basic health information and services needed to make appropriate health decisions” . The 2003 National Assessment of Adult Literacy incurporated health literacy, measuring participant performance on 28 tasks. Only 12% of those surveyed had proficient health literacy, with 14% of participants who had below basic health literacy skills and 22% of participants had basic health literacy skills . Clearly, nutrition is one important sector of health care where education is needed. A 68% overweight/obesity rate  suggests inadequacy in knowledge, motivation, and/or resources. A healthy diet plays an important role in overweight/obesity prevention as well as prevention of subsequent health conditions. However, understanding what comprises a healthful diet is complex and may require high cognitive skills. Because there is little discussion of health literacy within the nutrition literature, the aims of this study were to examine the level of attention to health literacy among nutrition professionals and to identify the skills/knowledge necessary for understanding nutrition education as perceived by nutrition professionals. A survey was performed to gather formative data pertaining to the extent of assessment that nutrition professionals were conducting prior to providing nutrition education (Survey Monkey©). All methods were approved by the Institutional Review Board (IRB). Three Dietetic Practice Groups (DPGs) of the American Dietetic Association (ADA) were selected (estimated n = 3251 members) because the natures of their practice areas involve nutrition education, and participants were recruited by email. To test the hypothesis that spending more of job time in nutrition education results in more attention to issues of health literacy, respondents were classified based on their estimate of nutrition education job as follows: 80% or more (almost all); 50% - 80% (majority); 20% - 50% (some); or less than 20% (minimal). Descriptive and comparative analyses were completed using SPSS (version 11.01, Chicago, IL 2001). We conducted a second study of nutrition professsionals using the “interview guide approach”  for key informant interviews. Our objective was to determine what basic skills are needed to understand nutrition/diet education. Our hypothesis was that nutrition professionals would identify components of nutrition literacy not included in general health literacy assessments. All methods were approved by the IRB. A recruiting email was distributed to 59 nutrition professionals with related research interests and/or nutrition education experience. Those who agreed to interviews (n = 8) were sent a consent document and interview questions to review before the scheduled interview. Telephone interviews were audio-recorded for the purpose of improved transcription accuracy. The guided interview contained 10 questions, six focusing on ideas and experience with nutrition literacy and four were demographic in nature. Data were evaluated using content analysis , identifying important examples, themes, and patterns in the data. Participation (n = 206) varied between questions, as can be seen in Table 1. In a one-way ANOVA comparison using the classification variable, Job time spent in nutrition education, a significant difference was found for the dependent variable, Availability of written materials for different levels of understanding (P = 0.025). Post hoc testing (Kruskal-Wallis) indicated a significant difference between those identifying spending >80% of job time and those spending 50 to 80% of job time in nutrition education more often replied they never, occasionally or sometimes had written material available for different levels whereas those spending 20 to 50% and <20% of job time in nutrition education more often they usually or always had different materials (P = 0.035). A significant difference was also found for two dependent variables: Availability of written materials for different levels of understanding (P = 0.006) and Adjusts education methods based on perceived understanding (P = 0.007) with Job description as the classification variable. Table 1. Response summary, selected questions. Public health nutritionists had materials more often than outpatient dietitians. Most significantly, the mode for question five indicated that of 125 participants, regardless of time spent in nutrition education, 99 (79.2%) did not use validated health literacy assessments when working with their clients. Participants (n = 8) indicated an average of 27 years (range 11 - 40 years) experience in the field of nutrition; seven were registered dietitians; all have graduate degrees in nutrition-related fields (Ph.D., n = 4); six indicated their jobs involve a combination of nutrition related research, education, and outreach. A significant theme among answers was that the skills required for understanding diet education were dependent on the type of diet instruction provided, with diabetes frequently noted as a disease requiring greater knowledge and skills. Conceptual skills for macronutrients were important with diabetes (n = 5), as well as basic math (n = 4 yes; 2 = depends) and portion sizes (n = 4 yes; 2 = depends). Knowledge of MyPyramid/food groups yielded mixed results (n = 3 yes; 2 = depends, 2 = no, 1 = no response). In addition, four indicated that all prompted components (macronutrient knowledge, food group knowledge, basic math skills, and competency with household measurements) were important. Unprompted comments indicated that diet and disease/health concepts were important (n = 4) as well as food composition/ingredients knowledge (n = 3). Key informants frequently addressed the need for certain skills in some diseases but not in others. With this idea in mind and with consideration of time constraints for nutrition educators, we developed a nutrition literacy assessment algorithm (Table 2) for determining if clients need macronutrient knowledge; numeracy skills for label reading; household measurement skills; or food group identification skills. In this way, only the skills that are needed to understand the anticipated education are evaluated. This preliminary research indicates that many nutrition educators are not conducting health literacy screening. It may be that current health literacy assessment instruments are inadequate for nutrition professionals because they do not identify a person’s nutrition literacy, only print literacy using health-related words and phrases. Validated instruments for assessment, such as the Rapid Estimate of Adult Literacy in Medicine (REALM) , the Test of Functional Health Literacy in Adults (TOFHLA)  and the Short Test of Functional Health Literacy in Adults (S-TOFHLA)  only evaluate print literacy and/or numeracy using words and concepts within health care. With relationship to nutrition, two instruments have surfaced, the Newest Vital Sign (NVS) and the Nutrition Literacy Scale (NLS). The NVS  has been validated as assessing both print literacy and numeracy, but no questions seek to identify nutrition knowledge. Diamond  published validation results of his NLS, but the instrument itself was not published, and it is unclear whether this instrument provides any measures beyond print literacy. Table 2. Nutrition literacy assessment algorithm. diabetes was often mentioned by participants as a disease requiring greater knowledge and skill in nutrition. Reduced health literacy is common in those with diabetes  and is associated with poorer glycemic control  and increased episodes of hypoglycemia . For effective blood sugar management, the American Diabetes Association recommends medical nutrition therapy for those with diabetes to include monitoring of fat and carbohydrate intake, and attention to overall energy intake for those who need to lose weight . Further, because of the likelihood of comorbidities, those with diabetes should often be concerned about other nutrient intakes as well, such as saturated and trans fat, sodium, and cholesterol . Other diseases with relationship to nutrition that have implications for reduced health literacy include hypertension  and infant and child feeding practices , and, although research is not yet available, there is also growing interest in the chronic kidney disease population . Although the number of survey participants in part 1 of the study was only 6.3% of the total, the DPG listserve organizers indicated it is expected that 25% - 30% of email recipients (781 - 975 people) would have opened the email invitation (personal communication, two DPG webmasters). With this as the survey sample, 26% completed the first question of the survey, with varied participation in other questions. As such, participation reached the expectation of 25% . Likewise, the small number of participants in part 2 of this research is a noted limitation. However, the participants each speak from years of experience in nutrition education, which strengthens the credibility of the data. In addition, it was determined with these participants that we achieved saturation of response. Regardless of the disease state, potential exists in any patient or client education encounter for reduced health literacy. While counseling skills are important , having tools to use in those counseling sessions is equally important. While most literacy research focuses on print material adaptation , knowing topics that need to be covered is essential. However, without an instrument that specifically addresses nutrition, nutrition professionals are limited to identifying problems with print literacy and numeracy, which may not provide enough information in regard to skills in measuring portion sizes, understanding macronutrients, or food groups. Our algorithm allows nutrition professionals to choose assessments based on the skill needed for understanding the nutrition education to follow. Neilson-Bowman, L. (2004) Health literacy: A prescription to end confusion. Institute of Medicine, National Academies Press, Washington DC. Patton, M.Q. (1990) Qualitative evaluation and research methods. Second Edition, Sage, Newbury Park. Patton, M.Q. (1987) How to use qualitative methods in evaluation. Sage, Newbury Park. Davis, T.C., Long, S.W., Jackson, R.H., Mayeaux, E.J., George, R.B., Murphy, P.W. and Crouch, M.A. (1993) Rapid estimate of adult literacy in medicine: A shortened screening instrument. Family Medicine, 25, 391-395. American Diabetes Association (2010) Standards of medical care in diabetes 2010. Diabetes Care, 33, S11- S61.